Let’s start with the smallest model that ASUS is launching today. The MeMO (I can’t fathom why the name is stylized like that) is a 7” slate with Honeycomb and a Snapdragon MSM8260 SoC inside. The MSM8260 has two Scorpion cores clocked at 1.2GHz and a new GPU, the Adreno 220. The 220 should be a decent step above the 205, which itself was a huge jump over the anemic 200. Qualcomm’s specs indicate that the 220 is capable of pushing pixels a lot faster than the 205; they quote a 3D pixel fill rate of 532 million per second (205 was rated at 245M/s) and a triangle poly fill rate of 88M per second (205 was 41M/s). Also, the Adreno 220 adds support for 1080p playback and recording at 30fps. On paper at least, then, Adreno 220 should be about twice as fast as the 205. So that’s the SoC, now back to the MeMO. The 7” display is an IPS unit with LED backlighting, capacitive touch, and WSVGA (1024x600) resolution. The IPS screen is a recurring theme here; all four of ASUS’ announced tablets have IPS screens, showing that ASUS recognizes the importance of viewing angles on handheld devices. There are two cameras, a 5MP rear camera with an LED flash and a front facing 1.2MP webcam. There’s a micro-HDMI port to push 1080p video to your TV, to go along with the usual micro USB port and microSD slot. Connectivity-wise, you’re looking at a GSM/HSPA+ radio, 2.4GHz 802.11n, and Bluetooth 2.1. The GSM radio is the interesting part, since it allows the Eee Pad to make calls via a separate Bluetooth-based media phone extender that ASUS is calling MeMIC. 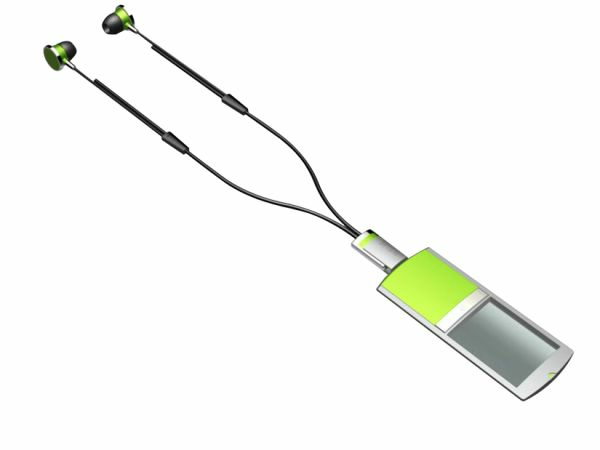 It looks like a 4th gen iPod nano with matching earbuds and can be used to make calls, SMS, or play back music. There is no word on whether it will be included with the MeMO or how much it will cost in addition, but we'll keep our eyes out for it at the show. 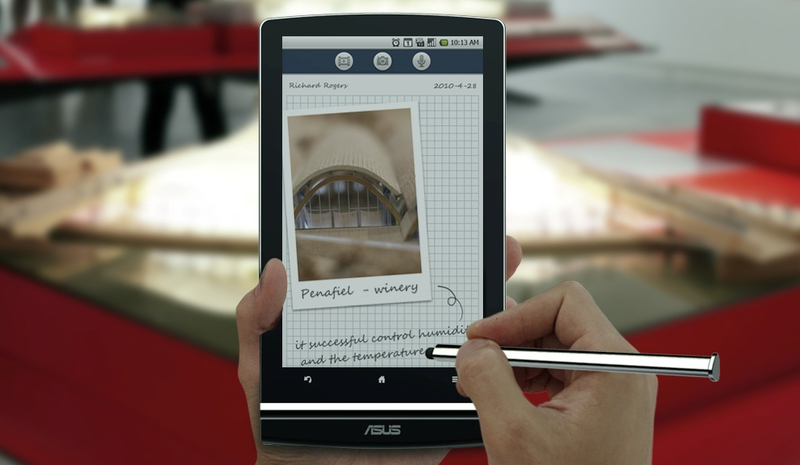 Handwriting junkies take note—ASUS is optimizing the MeMO for pen-based writing and is shipping it with a stylus pen to take handwritten notes. It’s still just a capacitive touch pen, but ASUS is serious about the hand-writing capabilities of the MeMO and claims that the screen works with smaller and more accurate pen tips. They’re even bundling two apps specifically designed to make use of the enhanced pen input—Media Note and Painter. Media Note (shown below) gives you a graphing paper background to write notes, sketch, or create a multimedia note. Painter is, naturally, an image creation/editing application. It allows for pressure sensitive input to simulate a more realistic drawing experience. The MeMO is set to ship in the Q2/Q3 timeframe with a prices between $499 and $699, presumably depending on the storage capacity and connectivity options. It’s certainly an interesting device, but I’m not too sure about some things. The phone extender looks like a cool idea, but the practical uses remain to be seen. Next, while I’m glad ASUS is choosing to focus on the handwriting potential in tablets, I’m not sold on capacitive touch pen inputs for serious notetaking. It’s better than the old resistive touchscreens, but compared to the active digitizers from Wacom and N-Trig it’s not as capable. We’ll have a hands-on with the MeMO at CES, so we’ll definitely be able to see if ASUS has improved the capacitive handwriting. Other than that, the MeMO looks like a pretty solid entry to the 7” tablet market—the IPS display and dual-core Snapdragon processor should keep it close to the top, even with lots of competition from the rest of Android, Inc. on the way soon. 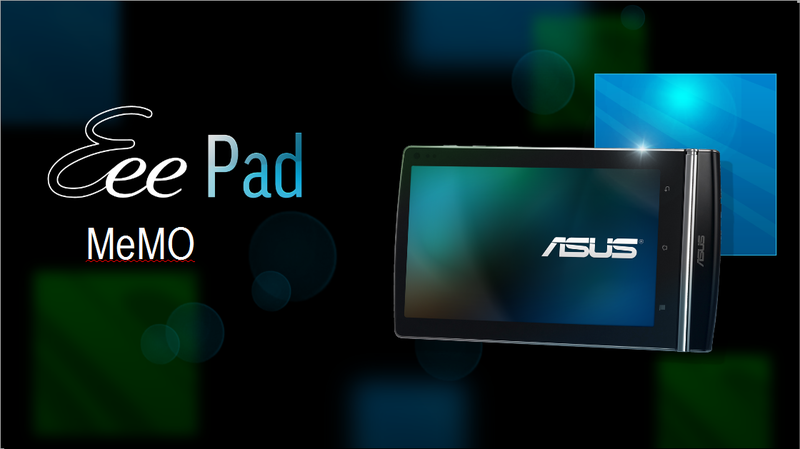 So, with the MeMO out of the way, let's take a look at the next tablet on our list. As with all things computing, the success hinders on options and price. They have to give enough of the former and reduce enough of the later. The high profit margin is the only reason that anyone is entering the market. Without the high profit margin, no one would introduce a single, let alone four, products. GPS. EVERY tablet should have GPS. Tablets are little more than a gimmick, but the addition of GPS would add solid value at very little cost to the manufacturer. Not to mention beating Apple, which irritatingly omitted GPS from half the iPads. In real life usage that is going to mean less than 2 hours of battery life. Anybody else find it interesting that Asus is going with IPS displays across the board here when they generally do not use IPS displays in their mainstream desktop monitor line of products? Does this signify a shift in focus that will carry over to their desktop monitors or will it be exclusive to their tablet/slate product line?